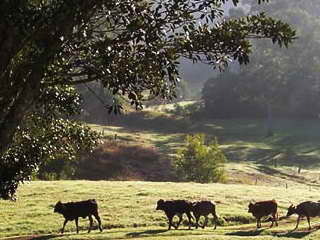 Bangalow accommodation, tours, attractions and activities for visitors. Byron Bay hinterland accomodation. Bangalow tourist information and Bangalow weather. About Bangalow NSW, 2479, New South Wales, Australia. Originally named Byron Creek, it's believed that the name 'bangalow' meant a kind of palm tree in the language of the local clan of the Bundjalung people, who lived in the area before European settlement in the 1840s. Now considered part of the Byron Bay hinterland, and less than 15 minutes drive to Byron Bay, Bangalow is located on the old Pacific Highway, and retains some of the region's best street architecture. Previously the centre of the district's dairying industry, hobby farmers and families looking for a more peaceful lifestyle settled on rural subdivisions, taking up subtropical fruits, coffee, macadamia and herb farming, providing visitor accommodation or establishing art and craft studios. Federation homes and cottages have been turned into elegant guesthouses and B&Bs, while numerous cabin and cottage accommodations are scattered throughout rolling hills in surrounding villages and small hamlets, which inlcude localities with evovative names like Coorabell, Rosebank, Clunes, Federal, Newrybar and Eureka. Bangalow's main street is closed off for the annual Billy Cart Derby held on a Sunday in May, providing wonderful examples of the imagination, talent and some would say foolhardiness, of local kids and kids at heart, when it takes over the street. Enjoy a spot of window shopping or antique hunting among the retail outlets housed in turn of the 19th century heritage buildings, find that special souvenir from amongst the craft outlets, or visit the famous "Abracadabra", who boast that they "have the biggest bunch of baskets under the sun". A visit to the Bangalow Historic Museum can while away an hour or two, with an interesting collection of local memorabilia. Afterward, you can enjoy local coffee and fine fare at one of the alfresco cafes, while you watch the passing parade. For something completely different, the Bangalow markets held on the 4th Sunday, will whet your appetite. NightCap National Park. While the proximity to Byron Bay, is undoubtably an attraction for many, the World Heritage listed NightCap National Park and Whian Whian State Conservation Area on the southern flank of the Mount Warning volcano provides a great diversity of both eucalyptus and rainforest stands, with a major feature being the Minyon Falls, plummeting more than 100 metres over the cliffs. Rummery Park. Accessed through a winding forest drive, bush camping ($) is available at Rummery Park, located a kilometre or so from the falls, and facilities include car park, BBQ facilities and picnic area, toilets and shelter shed.It's a great day outing, with viewing platforms and interpretive signage through rainforest, where you can go on self-guided birdwatching and bushwalking tours. If you're more adventurous, try a guided bushwalking or bicycle tour with experienced locals, or check out day tour options. Getting to the region is easy: Bangalow is approximately 770 kilometres - about 10 hours drive north from Sydney and about 120 minutes drive south from Brisbane, via the Pacific Highway, and about 15 minutes drive south west of Byron Bay. Driving options include the Pacific Highway and Summerland Way (via Lismore) in New South Wales, and Pacific Highway and inland Mount Lindesay Highway from Queensland. Domestic flights operate from all capital cities to Ballina/Byron Gateway Airport and Gold Coast Airport at Coolangatta. A number of international carriers servicing SE Asia, New Zealand and the Pacific fly into Gold Coast Airport. Intrastate flights are also available to Lismore Airport, with all airports having airport car hire or other car rental services available nearby. Daily airport transfer services between Ballina/Byron Gateway Airport and Gold Coast Airport, are available to selected localities in the region, with some shuttles also going to Brisbane International Airport. Visit Gold Coast Airport Transfer Services for more information. Daily interstate coach services are available for Brisbane, Sydney and Melbourne, with a daily or overnight train from Sydney to Brisbane via coach transfer at Casino. Blanches Bus Service provides daily timetable services between Bangalow, Ballina and Byron Bay. See Bangalow - Transport Services Information for more transport information, including trains, coach and local bus schedules, taxis, airport, and transfer services. Northern Rivers Carpool provides locals and visitors with the opportunity to share transport in the region.